KUALA LUMPUR: Property prices in Malaysia are forecast to increase by 5% to 10% this year against last year in line with the recovering economy. Association of Valuers, Property Managers, Estate Agents and Property Consultants in the Private Sector Malaysia president James Wong said the market did not expect a big jump in property prices this year as the economy was not fully recovered yet. The economic recovery will largely influence the property market performance and Malaysia’s gross domestic product (GDP) growth rate this year is forecast at 2% to 3% from the estimated contraction of 3% last year. “Condominiums and apartments are currently selling well and landed property prices, which had held through the economic crisis last year, are expected to grow this year,” Wong said after the opening of the Malaysian Property Summit 2010 yesterday. Citing examples, Wong said the St Mary’s serviced apartments were 80% taken up within five days of their launch, Sky Residences recorded a 70% take-up rate and the 50-unit Verticas Residensi in Bukit Ceylon achieved a 60% take-up rate during soft launch. “This shows that condos and apartments are not short of buyers. And developers that postponed property launches last year are not expected to do so this year,” he said, adding that property prices last year were estimated to have dropped by 5%. However, Wong raised some concerns about tenancy of condominiums and apartments. “A lot of new developments are facing a hard time in getting tenants,” he said. Another area of concern would be the office market that saw the supply of four billion sq ft of space last year, according to Wong. “Thus, there is a slight concern on the take-up rate, especially for tenants that will occupy huge space of 20,000 sq ft and above as well as the effect of the new supply on rental rates,” he said. Valuation and Property Services Department director-general Datuk Abdullah Thalith Md Thani said this would be a good year for the property sector as key economic indicators that related to the growth of the industry were expected to perform better than last year. The expected recovery in the GDP of Malaysia’s main trading partners – the United States, Japan and Singapore – and improved prices for crude oil, crude palm oil and rubber would augur well for the country, he said. In fact, the property market, which had slumped in the first half of last year, had improved since the second half-year, he added. The Malaysian property market, estimated to have registered transactions worth RM75.42 billion last year, is expected to improve further in 2010 in line with the economic recovery. He said the challenging economic and financial environment had affected the performance of the Malaysian property market last year. "This year will be a good year for all. The property market for this year will improve as the number of transactions involving new housing and construction activities, increases," Abdullah Thalith told reporters at the Third Malaysian Property Summit 2010, in Kuala Lumpur yesterday. These, he said, will help to increase the confidence level among consumers and provide a positive impact for the property sector. He said the liberalisation of Foreign Investment Committee (FIC) guidelines, would lift the competitiveness of Malaysia, as an investment destination. Furthermore, Abdullah Thalith said, acquiring properties in Malaysia would be even more attractive, as the FIC approval is no longer required. He said the review of the Real Property Gains Tax would augur well for the property industry. The world's biggest commercial property consultant, CB Richard Ellis (CBRE) expects Malaysia's property market to be fairly stable in terms of rental and capital value with increased foreign investments flowing into the property sector. "We don't anticipate a major crash or upturn this year as we are not overbuild. "Foreign funds drifted away with the financial crisis and now it's picking up slowly with the liberalisation measures creating new opportunities for investors," said the Executive Chairman of CBRE (M) Sdn Bhd Christopher Boyd at a press conference in Kuala Lumpur today. He also said developers should trade cautiously for the next six to eight months as there is still no end to the problems in the West. Boyd also said Malaysia's property market was transparent and this would be the key driver in attracting foreign investors. "Besides, the healthy financial environment will also augur well in luring investors," he added. Currently, he said good investments are hard to come by and investors are looking particularly at newly completed buildings in established areas of Klang Valley, Johor and Penang. Boyd said CBRE expects at least 30 major transactions in commercial properties to take place this year, primarily in the Klang Valley. "In the second-half of last year, 28 major transactions took place with a total value in excess of RM3.5 billion despite the global financial crisis. This year we expect perhaps 28 to 30 (transactions) or more. "With the rules on foreign ownership becoming very clear, it has augured well for foreign interest as well as place Malaysia's commercial investment market on par with most countries in the region," he explained. Speaking on rental rates, Boyd said: "There is quite a healthy supply of space coming on to the market. About 2.8 million to 3 million square feet will be available in the next three years as there isn't going to be a squeeze on rental," he said. Elaborating further, he said office rentals in Kuala Lumpur are expected to stabilise in the first-half of 2010, barring any major economic setbacks. "The combination of modern infrastructure, quality facilities and comparatively cheap rentals makes KL a highly attractive location for any prospective multinational considering a move," he added. CBRE expects continued broad-based demand across a wide range of sectors including Islamic finance, the oil and gas industry, agribusiness and commodities. Meanwhile, Boyd said the trend of stepped-up rate of completion of office development for the next three years was set to continue. The company expects a further 2.40 million square feet of office space to be added this year, to existing supply, 2.82 million square feet next year and 3.93 million square feet in 2012. He added despite weakening rentals and slightly higher yield expectations, office capital values were expected to remain steady throughout 2010 generally ranging between RM800 and RM1,200 per square feet. Looking ahead, he said demand for green buildings in Malaysia would continue to rise as environmental awareness grows. Multinationals would remain at the forefront of the trend, increasingly adopting a commitment to lease green office space, wherever possible. PETALING JAYA: Two major property groups, Sunrise Bhd and Sime Darby Property Bhd, have teamed up to jointly develop a RM1bil integrated commercial property project in Bukit Jelutong, Selangor. 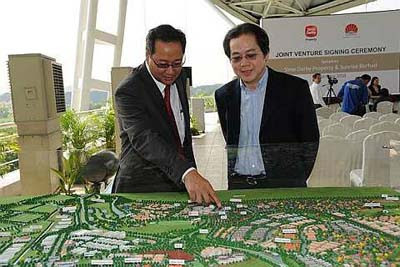 Datuk Tunku Putra Badlishah (left) and Sunrise Bhd executive chairman Datuk Tong Kooi Ong looking at a model of the Bukit Jelutong township following the JV signing ceremony on Tuesday. “The proposed development will be launched and developed in five phases from 2011 onwards,” Sunrise said yesterday in a statement to Bursa Malaysia. The project will be undertaken via a joint venture (JV) vehicle – Baywood Avenue Sdn Bhd – with each party holding 50% stake. Baywood has entered into sale and purchase agreements to acquire three parcels of freehold land totalling 20.95 acres from Sime Darby Bhd’s wholly owned subsidiaries Highland & Lowlands Bhd and Augsburg (M) Sdn Bhd for RM114mil. Sunrise’s share of the purchase price amounts to RM57mil. “Through this strategic partnership, we are able to unlock the value of its landbank and create a commercial hub within the township of Bukit Jelutong,” Sime Darby Property managing director Datuk Tunku Putra Badlishah said in a separate joint statement. The overall project was expected to be completed in seven years from the first launch. “It is expected that the JV will also pave the way for future collaboration between Sunrise and Sime Darby Property,” Sunrise said. The commercial development will have a built-up area of 2.7 million sq ft, consisting of retail, shop offices, office suites and service apartments. “The proposed development will provide shopping convenience and easy access to services for the 25,000 residents and working population in Bukit Jelutong, which has good access to a series of highways,” Sunrise said. Sime Darby Property Bhd (Sime Property) is partnering Sunrise Bhd to develop a RM1 billion integrated commercial project in the Bukit Jelutong township in Selangor next year. It is the first tie-up between Sime Property and Sunrise. Sime Property is known for its landed properties, while Sunrise is well known for its high-end projects in Mont'Kiara, Kuala Lumpur. The deal means that both companies can take advantage of each other's strengths, Sime Property managing director Datuk Tunku Putra Badlishah Tunku Annuar said. "We are always looking at ways to accelerate the land development with reputable and like-minded developers like Sunrise. This partnership will further enhance the value of properties at the township," he said after signing the joint-venture agreement in Bukit Jelutong, Shah Alam, yesterday. Sime Property has 14,800ha in Greater Klang Valley. The two firms will have equal stakes in the joint-venture company, Baywood Avenue Sdn Bhd. They plan to build retail, shop-offices, office-suites and serviced apartments on some 8.4ha. The project, located opposite Sime Darby Pavilion, will be developed in five phases over seven years, beginning next year. The joint venture will buy the land from a subsidiary of Sime Property for RM118.1 million, or RM125 per sq ft.
Sunrise executive chairman Datuk Tong Kooi Ong said the vision is to develop sustainable, or green, properties that will appreciate in value. Sime Property and Sunrise may even do more projects together. "We have completed the first part of the marriage today. This means, going forward, things will be easier for us as we have already built a base here. If the project goes well and the chemistry is there, the joint venture could be extended," Tunku Putra Badlishah said. It is learnt that Sunrise may want to partner Sime Property to develop pockets of land along the Guthrie Corridor Expressway. Tunku Putra Badlishah also said that the project will be the first of many joint ventures Sime Property will be forming with reputable developers. It is already in talks with several other developers and may ink a second deal soon. The joint venture (JV) between Sime Darby and the Sunrise Group for an integrated commercial development on a 21-acre site in Bukit Jelutong is expected to be positive. This is because it allows Sunrise to replicate its success in developing Mont Kiara in another prime location, says ECMLibra Investment. "We believe there is a captive market for the product offerings proposed by the JV," said ECMLibra Investment in its research note today. The research house also expects earnings contribution for the Sunrise Group from the project, slated to begin in 2014. 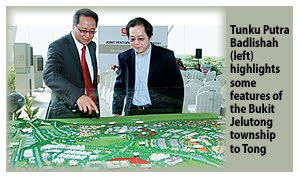 Sunrise announced yesterday that it had entered into a 50:50 JV with Sime Darby to develop the land in Bukit Jelutong. The JV will acquire the land from Sime Darby for RM114.1 million cash. Based on the initial GDV and assumed net margin of 18 per cent, the share of net earnings for Sunrise will be RM90 million over the development period, ECMLibra Investment noted. It added that, although the initial estimate GDV is RM1 billion, the figure is believed to be conservative. Meanwhile OSK Research Sdn Bhd, in commenting on the JV, said it would likely be a significant driver for the earnings of Sunrise, going forward. The financial impact on Sime Darby's joint venture (JV) with the Sunrise Group is negligible, says ECMLibra Investment Research. ECMLibra Investment also indicated that the JV was most certainly in line with the Sime Property segment's aspirations, said the research house in a statement today. Sime Darby Property Bhd and Sunrise Bhd announced yesterday that both had entered into a JV to develop three lots of freehold commercial land in the Bukit Jelutong Township. The project has an estimated gross development value (GDV) of RM1.0 billion. Both companies have also formed a 50:50 joint-venture company to develop it. "We believe the move falls into the Group’s master plan for the Sime Darby Vision Valley (SDVV),of which they expect to announce more details soon," said ECMLibra Investment. Bukit Jelutong is part of the SDVV called the Selangor Vision City which consists of Bukit Jelutong (90 per cent completed), Denai Alam (30 per cent completed) and the Elmina and Lagong Logistics Hub. PROPERTY developer Sunway City has hired RHB Investment Bank and Credit Suisse as the main coordinators for the planned listing of its real estate investment trust (REIT) in Malaysia, sources with knowledge of the deal said on Wednesday. “The REIT will have a market capitalisation of more than RM3 billion,” said one source. Sunway City, valued at US$440 million, told Reuters last year that it may revive the plan to float its property assets in 2010 depending on the recovery in markets. Sunway City said earlier this month the REIT will group at least four properties in the capital Kuala Lumpur and one in northern Penang state. PETALING JAYA: MK Land Holdings Bhd has denied that there is a dispute in the internal management of the company and a vacuum exists in the management. General manager of its legal department, Preetie Boler, said in a statement that contrary to the StarBiz report yesterday, MK Land shares probably dipped because of the overall market downturn and not due to a management dispute. According to her, executive chairman Tan Sri Mustapha Kamal Abu Bakar is still leading the company. Boler said it was untrue that Lau Shu Chuan was appointed together with the three senior executives – R. Balasundram, Fatimah Wahab and Yusof Abu Othman – in November 2008. “Lau has in fact served the company since March 7, 2000 and appointed chief operating office in September 2004,” she said. She said the company was “intensely moving ahead” with its three-pronged approach – sales of properties, cost-control measures and a corporate exercise – to strengthen its position as unanimously approved by its board of directors. “The company has even appointed Hong Leong Investment Bank Bhd to undertake the exercise and an announcement was made by Hong Leong Investment Bank to Bursa Malaysia on Jan 14. “Meanwhile, the company has gone ahead to appoint professionals such as advisors, valuers and lawyers to implement the corporate exercise,” she said. Boler said it was normal for every company to have a succession plan, and internal management changes or reshuffling were an ongoing process for the betterment of the company. PETALING JAYA: Resorts World Sentosa’s (RWS) four newly opened hotels are booked solid till end of next month, according to the Singapore Business Times (SBT). The SBT report said the republic’s first integrated resort (IR) revealed on its Facebook fan page last Friday that the four hotels “have reached maximum capacity” until the end of April. In an update post on Saturday, however, it said that it had “managed to free up some rooms” in March and April. Occupancy rates at RWS’ four hotels soared to over 90% during this past weekend, assistant director for communications Robin Goh was quoted as saying. Both the Festive Hotel and the Hard Rock Hotel Singapore recorded full houses. SBT said RWS expected to operate at full or near-full capacity during the weekends for the foreseeable future. “Already, every room during the nine-day period spanning the upcoming Chinese New Year holiday from Feb 13 to 21 has been snapped up by both Singaporeans and overseas guests eager to be among the first in the world to stay at the IR,” the report said. Collectively, the four hotels – Festive Hotel, Hard Rock Hotel Singapore, Hotel Michael and Crockfords Tower – offer 1,350 rooms and 10 restaurants. Two other hotels, Equariyus Hotel and Spa Villas, will be launched later this year and add 500 rooms. SBT reported that when the IR’s call centre first opened its hotline on Jan 11, the first three days alone saw some 5,000 room nights booked.